These lovely arrangements of ranunculus and garden roses are stunning; I always chose low, full blooms over tall, more structural centerpieces. And who can resist the simplicity of that menu-so chic! Photo by Justin and Mary Marantz. I've never been a fan of roses, but this setting is so gorgeous! garden roses are so modernly elegant. what amazing photos too! ranunculus are one of the prettiest kinds of flowers. i love the look of your blog - so light and clean. Oooh pretty! I'm with you on the low arrangement. Don't really see the point of the tall ones (which seem to be very popular on the TLC and WE wedding shows from the East Coast/NY/Jersey area, no?) except for when you first walk in the room. Then your guests are just staring at the base of an arrangement stand. oooh i really wanted ranunculus for my wedding but they were out of season! Wow. That is so beautiful!!! Such cute flowers, I love that they have a little sparkle to them in this photo! garden roses and ranunculus (and peonies)! are my favity faves. (and I don't discriminate against many). so pretty. that whole setting is so elegant! I love it! The arrangements are lovely - I think I prefer them to something higher and more outrageous. Girls, I'm so glad you're with me about tall arrangements! Annie's right-every WE/TLC/New Jersey wedding show features these sky high arrangements, and while they're impressive at first glance, ultimately they just interrupt conversation! Lena - so true! Never to mind that the simpler, smaller arrangements are so much more chic! I completely agree with the shorter stems. It's Martha Stewart's specialty in my opinion. And I do adore that menu. So sweet! This is so elegant, I love the flower arrangement. We definitely employed this technique in our wedding :) I love love love the lower arrangements...you can actually see the other guests on the opposite side of the table! i love love ranunculus flowers. they are definitely on my list of favorite blooms. i LOVE this look...so soft and minimal. oh yes, such a sweet little arrangement! I've never been a huge roses fan, but that is just gorgeous. Also you consider those shoes practical? I'd totally fall on my behind if I had to walk ANYwhere in those! :) even though they are absolutely adorable. i love how bright, white, and pretty these look! 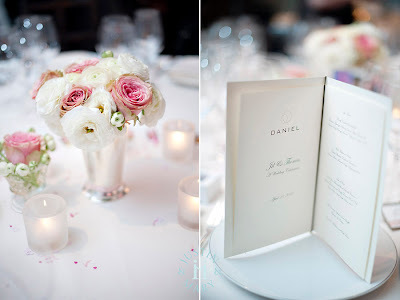 i am a fan over shorter blooms as well so that i can see the other person across the table!! ooo! I love how these photos almost sparkle. There is definitely beauty in simplicity.